[Review] CamTranslator For Android Takes On Word Lens For iOS, Helps You Translate With Your Eyes; But Does It Actually Work? Have you ever been in a foreign country and tried to find your way around, order from a menu, or read a map in a language that you don’t understand? Language barriers can be incredibly frustrating, but we found a new app designed to go head-to-head with iOS’s Word Lens that can help you next time you’re in that kind of situation. 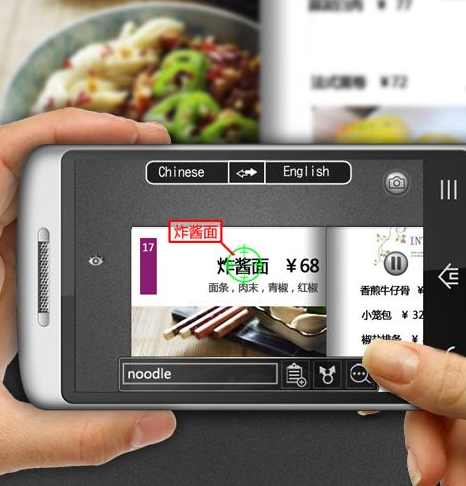 CamTranslator is a new app from IntSig that is designed to help break the communication barrier between languages using your phone’s camera. It includes a massive collection of over 50 languages that will translate both ways, two different modes of translation, and a few other quaint features. Here’s how it works: Let’s say you’re looking at a sign that’s written in Chinese and want to know what it says. 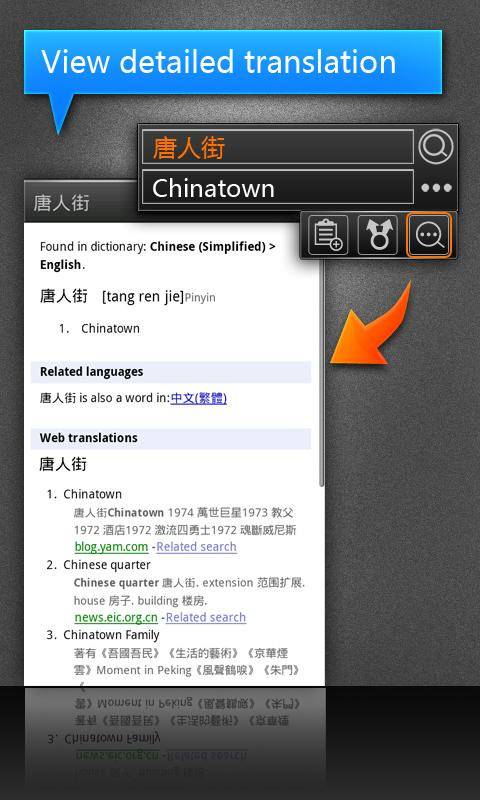 Grab your phone, open up CamTranslator, and tap the screen when the word you want to translate is in the center. Easy enough, right? CamTranslator offers two different ways to grab the images used for translation - real-time translations or picture translations. 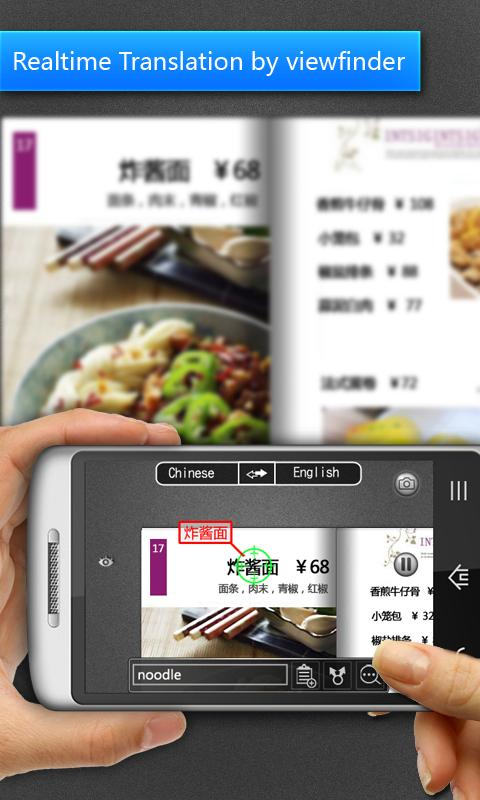 Just as it sounds, real-time translations happen on the fly - all you have to do is point the camera at the word you want to translate and tap the screen. It’s not as easy as it sounds though - you have to hold the camera perfectly still and be at an appropriate distance. If you’re too close, it will only read part of the word; too far away, and it won’t read anything. The same goes for picture translations, which can be a little bit less frustrating if you take the pic from a good distance the first time. 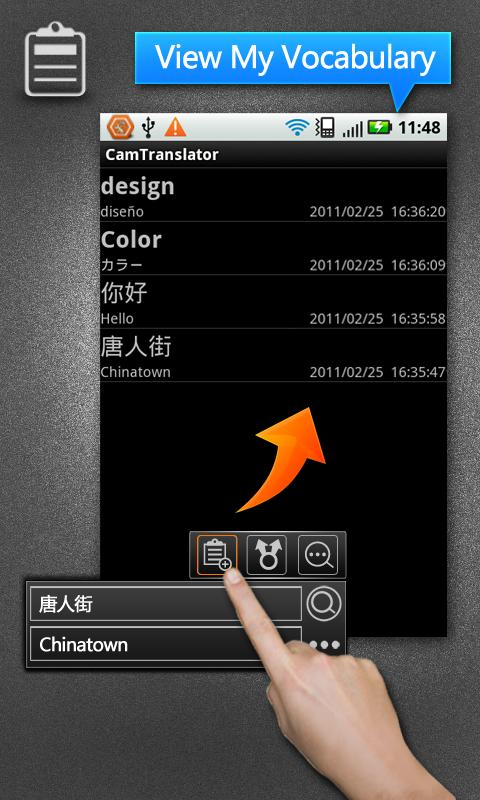 Once you snap the pic, it will open in a different interface, but it’s still quite similar to the real-time translator. You don’t have to be as meticulous once you’ve grabbed the image, so this mode is much easier to use. It’s a simple tap and translate. In order to gauge how well this app actually works, I tested it using three different types of text on both real-time and picture translations - packages, handwritten, and printed manuscript. Tonight happened to be grocery night, so while we were picking up ingredients for homemade sushi, I pulled out my phone and tried to translate some of the Japanese images on the packaging. Real-time Translator - After trying several different packages, I came to the conclusion that it just wasn’t going to work. 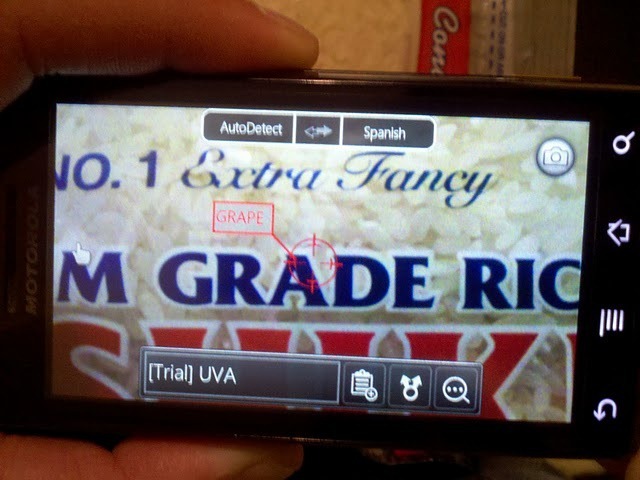 I decided to try translating English to Spanish, but the closest that I got to an accurate detection was “grade” detected as “grape”. I assume it’s because of the almost-reflective surface of most packaging. 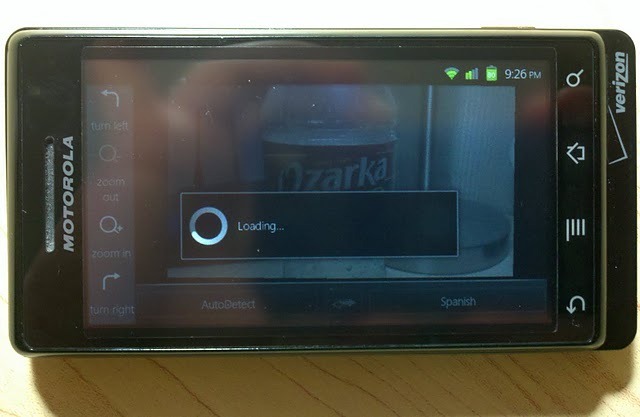 Picture Translator - After not getting any real results from the real-time translator, I snapped a picture to see if I could have better luck with the picture translator. Just like I expected, it was tedious and didn’t detect any of the symbols correctly. A bit disappointing, I know. Once we got home, I decided I would see how well it could handle handwritten notes. Not only did I write a few, but I had my fiancee write some for the purpose of diversity. Real-time Translator- No matter what I did, there was no way it was going to detect any sort of word in the handwritten notes. I think I have very nice handwriting, too. Picture Translator - Just like with the real-time translator, it wouldn’t detect anything, only returning and “Unrecognized” error. So much for that. To be fair, I thought I would give this app one last chance to redeem itself - the published word. So I grabbed a book, opened to a random page and went to work. 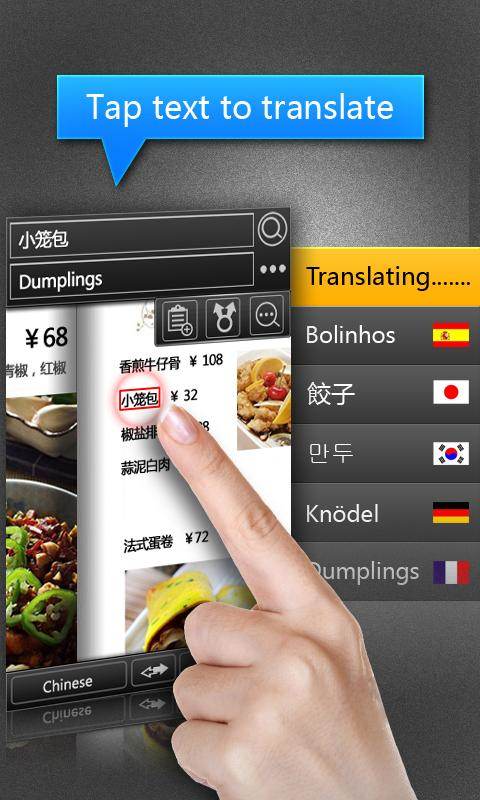 Real-time Translator - This is where CamTranslator really shows what it’s made of. It detected every last word that I checked in mere seconds and translated them almost immediately. It was still a little bit difficult to get the right angle and focus, but overall it was pretty painless. 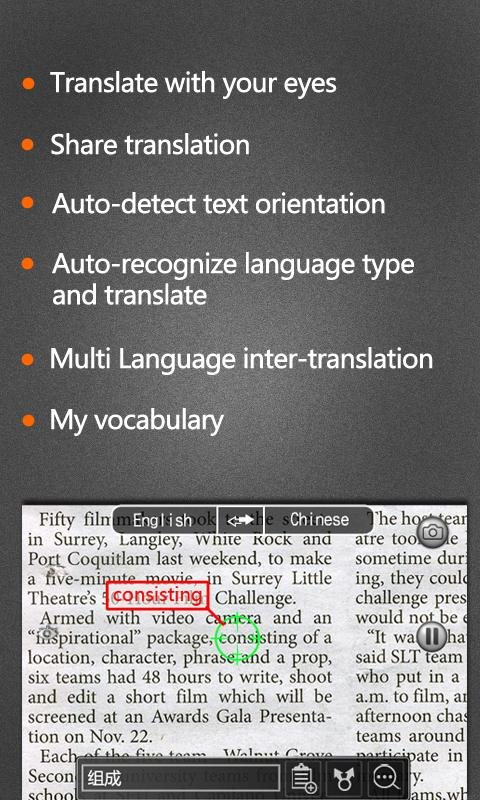 Picture Translator - This was even better than the real-time translator. The picture came our crystal clear and every tapped word translated within seconds. Now that the primary function of the app has been put to the test, let’s talk about some of its other features. It’s not really packing a whole lot more under the hood, but for the sake of completeness, I will mention them here. Vocabulary - You can save as many words as you like in your “vocabulary” for quick and easy reference. It saves the native word, translated word, and the date and time. It would have been nice if it included the original and translated languages, but that may be asking too much. Detailed Translations - This gives a little bit more in-depth explanation of the translation, including alternate dictionary translations, Google translations, and usage examples. The examples may help in some situations, but the complexity of example sentences would leave me more confused about proper usage if I didn’t have prior knowledge of the word. At least we know their intent was good. Share - About as basic as it gets - it shares both the native and translated words through social networks, e-mail, or any of the other various mediums in which you may share content. “Other Apps” - A plug to the creators' other apps in the Market. If you’ve noticed the severe lack of my own screenshots in this article, it’s not because I didn’t try. One weird quirk that I ran into was that it would NOT let me take any screenshots while within the app. I tried several different screenshot applications just to make sure that it wasn’t my go-to screenshot app causing problems. If you “home” out of CamTranslator while in picture translator mode, it goes crazy. When you re-open the app, it will attempt to open the previously loaded picture, but it will never get past the “loading” screen. I was unable to back out of the app, close it, or even kill it with a task manager (before you judge, I only keep one on hand for instances like this. I do not condone the use of task killers). The only way to completely kill the app was to restart my phone. CamTranslator has potential to be good, but at this point I just can’t recommend it. I see it as more of a novelty that you may play with for a couple of hours, but it offers very little practical, real world use.